The Residency Program offers self-directed creative time to mediamakers from throughout the country. Since 1971 we have assisted over 1200 artists in the creation of works using new electronic video, sonic and digital technologies. Each year about 40 artists are invited to work in the studio, in a retreat-like workshop environment, which offers access to an image processing system, intensive individualized instruction and time for exploration and personal creative growth. The image processing system is a hybrid tool set, permitting the artist to create interactive relationships between older historically important analog instruments and new digital technologies, and to explore boundaries and intersections within narrative, documentary and social issue traditions as well as more experimental forms. With a grant in 2003 from media The foundation, we were able to significantly advance the digital components of the imaging system, incorporating a second G4 computer, other sonic and control modules by Doepfer, interactive software including Max/MSP and Jitter, as well as DVD authoring and editing software. This year's artists represent 11 states, Canada, Sweden and Switzerland. Over one-third are artists from outside New York State. Applicants in 2002-03 included Mara Alper (Ithaca, NY), Michael Betancourt (Miami, FL), Bebe Beard (Boston, MA), Peer Bode (Rochester, NY), Jon Cates (Chicago, IL), Sarawut Chutiwongpeti (Elmhurst, NY), Caroline Koebel (Buffalo, NY), Graham Collins (Ottawa, Ontario), Carrie Dashow (Brooklyn, NY), Aaron Davidson (Brooklyn, NY), Melissa Dubbin (Brooklyn, NY), Maria Dumlao (Brooklyn, NY), Monica Duncan (Prospect, KY), Erica Eaton (Rochester, NY), Nicholas Economos (Alfred Station, NY), Raymond Ghirardo (Ithaca, NY), Ronald Gladkowski (Mt Upton, NY), Nancy Golden (Jersey City, NJ), Tyler Gooden (Clarkton, NC), Alex Hahn (Switzerland), Jennifer Hamilton (Regina, Canada), Pamela Hawkins (Rochester, NY), Sachiko Hayashi (Sweden), Karen Hibbard (Montreal, Canada), Sara Hornbacher (Atlanta, GA), Shaun Irons (Brooklyn, NY), Katarina Jerinic (Brooklyn, NY), Istvan Kantor (Canada), George Kindel (Williamsville, NY), Meg Knowles (Buffalo, NY), Shirin Kouladje (Canada), Annie Langan (Prospect, KY), Elodie Lauten (NY, NY), Darrin Martin (Alfred Station, NY), Laura McGough with Steve Bradley and the NOMADS (Washington, DC), Lori Anderson Moseman (Brooklyn, NY), Chris Musgrave (San Francisco, CA), Lara Odell (Buffalo, NY), Monica Pansarino (NY, NY), Lauren Petty (Brooklyn, NY), Blithe Riley (Chicago, IL), Patricia Riske (Wall, NJ), Megan Roberts (Ithaca, NY), Ron Rocco (Brooklyn, NY), Rebekah Rutkoff (Brooklyn, NY), Lindsay Sampson (Buffalo, NY), Jon Satrom (Chicago, IL), Kurt Schultz (Oak Park, IL), Devlin Shea (Chicago, IL), Rachel Siegel (Rochester, NY), Frank Shifreen (NY, NY), Don Simmons (Calgary, Canada), Jason Simon (NY, NY), Alan Sondheim (Brooklyn, NY), Jed Speare (Ayer, MA), Jim Supanick (Brooklyn, NY), Liselot van der Heijden (Jackson Heights, NY), Angel Vasquez (San Francisco, CA), Julius Vitali (Allentown, PA), Tobaron Waxman (NY, NY), Tony Weathers (Seattle, WA). Tapes produced at the Center were again included in EXHIBITIONS throughout the United States and Europe. Recent exhibition venues have included the Detroit Museum of New Art, Memling Museum (Brugge, Belgium), New York Center for Media Arts (NYC), New Museum (NYC), Eyebeam Atelier (NYC), Smackmellon Gallery (Brooklyn), Squeaky Wheel (Buffalo), Hallwalls (Buffalo), Visual Studies Workshop (Rochester), Robert Beck Memorial Cinema (NYC), MoMA (NYC), Roulette (NYC), Centre de Cultura Contemporania de Barcelona, Art in General (NYC), PS 1 (NYC), and in festivals including the Dumbo Under the Bridge Annual Festival, New York Expo of Short Film Festival, the National Computer Artists Invitational, and the Festival of Electronic Music and Media (CA). Tapes are distributed by Electronic Arts Intermix, Filmmakers Coop, Drift Distribution, Facets, Women Make Movies and many others. Artists working at the Center this year have received awards and recognition from the Ohio Arts Council, the New York State Council on the Arts and other State Arts Councils, Canada Council and won numerous awards and citations in festivals around the world. In keeping with our EDUCATIONAL objectives, we hosted the 8th Annual International Residency, a 10 day intensive residency available for academic credit to 18media makers. The workshop is co-taught by Pamela Susan Hawkins and Hank Rudolph. Several projects which will be developed in the coming year include a cinema cookbook, and a touring program concerning collaborative strategies in moving imagemaking. We also participate in online salons hosted by NAMAC and other information and advocacy groups. The Center serves as a SPONSORING ORGANIZATION for artists' projects in the electronic and film arts, providing support services, assistance with development and fiscal and administrative management services. We sponsor about 20 projects each year. Completed projects have received worldwide exhibition and distribution. In the last 6 years, with requests totaling over one million dollars, artists have received over $330,000. Completed projects have received worldwide exhibition and distribution, and have been supported by the National Endowment for the Arts, the NYS Council on the Arts, the Rockefeller Foundation, ITVS, Astraea Foundation, Soros Documentary Fund, Chase Manhattan and many others. Recent participants include Irit Batsry, winner of the prestigious Bucksbaum Award for "Neither There Nor Here", with a world premiere at the International Film Festival, Rotterdam and inclusion in the Whitney Biennial 2002; Alan Berliner for "The Sweetest Sound", featured on POV; David Blair for "The Telepathic Motion Picture of the Lost Tribe"; Slawomir Grunberg for the Emmy-award winning documentary "School Prayer: A Community Divided"; Barbara Hammer for "Culture Doctor", "The Female Closet", and her new work "Resisting Paradise"; Ken Jacobs for "NY Ghetto Fishmarket, 1903"; and Kristin Lucas for "Supervision". Recent projects have been supported by the New York State Council on the Arts, Creative Capital, New York Foundation for the Arts, The Radcliffe Institute for Advanced Study at Harvard University, the Jerome Foundation, and National Geographic. For 2002-2003 the following artists have received awards. Ariana Gerstein (Barton, NY) for "Milk", a feature experimental documentary with accompanying video installation, researching the relationship between food and technology. In addition to the NYS Council on the Arts, the University Research Foundation, Kodak and The Rockefeller Foundation provided substantial support. Distributors for Milk include Documentary Educational Resources & Indican Pictures. Her recent work, "Hybrid", completed with Monteith McCollum is a feature-length award winning documentary included in the 2002 POV series. Ariana Gerstein is an Assistant Professor in the Cinema Department at Binghamton University. Jacqueline Goss (Tivoli, NY) for "Kishlak Dwellers" an animated experimental videotape exploring the overlaps, gaps, and junctures found between orality, literacy, and the image-driven post-literacy of global multimedia and the World Wide Web. The project has received support from the New York State Council on the Art (2003), The Jerome Foundation (2003) and Eyebeam Atelier, and premiered at Eyebeam in 2003. Jacqueline Goss works in many electronic media and explores the fundamental issue of how ideas are translated between text, image and sound. Jeanne Liotta (NY, NY) for "Observando el Cielo", a 16mm experimental color sound film, imagining the human relationship to the cosmos. In addition to films, Liotta also creates digital media including Quicktime movies and interactive web works. Her works have been exhibited at the Whitney Museum, Viper International Film Festival, European Media Arts Festival and the Museum of Modern Art. Jenny Perlin (Brooklyn, NY) for "Perseverance and How to Develop It", a work which grew out of the discovery of a 1915 self-help book, discovered at a yard sale. Her films are grounded in the tradition of the "essay-film". The film received its world premiere at the Rotterdam International Film Festival, (2003) and was recognized with a Special Jury Award at the 2003 Ann Arbor Film Festival. Perseverance has received support from the New York State Council on the Arts, and through the Experimental Television Center's Finishing Funds program (2003). Exhibition: Premiered at the Rotterdam International Film Festival; Madcat International Womens Film Festival; Wexner Center for the Arts; Gene Siskel Film Center; Images Film Festival, Toronto; Belluard Bollewerk International Festival, Switzerland; "Power and Representation" Conference, Finland. Jenny Perlin's films work within and against the documentary tradition, incorporating innovative stylistic techniques to emphasize issues of truth, misunderstanding, and personal history. Since 1989 the Film and Electronic Arts GRANTS PROGRAM, has awarded over $800,000 to individual artists and arts organizations in the State. For 14 years, Finishing Funds has provided over $185,000 to New York State artists, to assist with the completion of diverse and innovative projects, and works for the Internet and new media. Among this year's projects are 8 film productions. Five different counties throughout the State are represented; 20% of recipients live in the Upstate region. 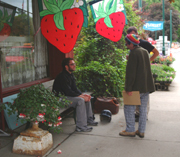 The works in progress have received recognition and support from other organizations including the Individual Artists Program of the New York State Council on the Arts, Eyebeam Atelier, Franklin Furnace, Thundergulch, the Lower Manhattan Cultural Council, the Swiss Institute, the Wesley New Media Center of Georgia Institute of Technology, Harvestworks, Pittsburgh Center for the Arts and Visual Studies Workshop. This year's peer review panel was composed of independent new media artist and educator Torsten Burns and Buffalo-based filmmaker and media activist Stephanie Gray. Finishing Funds is supported in part by the New York State Council on the Arts. With an award in 2003 from mediaThe foundation, Finishing Funds is supporting 5 special awards for New Media and Intermedia Performance; the awards went to G.H. Hovagimyan, Diane Ludin, Prema Murthy, Marina Rosenfeld, and the collaborative team of Brooke Singer and Beatriz da Costa. Recipients of Finishing Funds 2003 include Peter Bianco, Roddy Bogawa, Abigail Child, Carrie Dashow, Tirtza Even, Jennifer Fieber, David Gatten, Gretchen Hogue, Shelley Jackson, Amy Jenkins, Megan Michalak, Bernard Roddy, Kathy Rose, Kelly Spivey, and Roxanne Wolanczyk. Presentation Funds provides support to New York State organizations for in-person appearances by film and media artists. The program brings innovative cinema programming, including independent film and media art, as well as audio installation works to new audiences and to underserved communities in all regions of the State. In addition, the program assists organizations which serve special constituencies and encourages the development of new presentation venues throughout the State. The program supported in-person appearances before about 12,000 people, with cable and web audiences estimated at an additional 15,000. In 2003 we provided assistance to 49 sponsoring organizations in 17 counties across New York State. These organizations contributed over $536,000 toward these media projects. This year's recipients included Institute for Electronic Arts at Alfred University, American Museum of the Moving Image, Art in General, Art Mission, Film Department Bard College, Carnegie Art Center, CEPA, Chashama, Chatham Film Club, Cooper Union, Cornell University Cornell Cinema Crandall Public Library, Dansology Inc., Downtown Community TV, Eldridge Street Project, Emerging Arts, Engine 27, Everson Museum of Art, Eyebeam Atelier, Film-Makers' Cooperative, Cazenovia College Art Gallery, Flux Factory, George Eastman House, Hallwalls, Harvestworks, Loisaida Arts, Lower Manhattan Cultural Council, Media Alliance, Millennium Film Workshop, Munson WIlliams Proctor Institute, New Museum of Contemporary Art, Not Still Art, Ocularis at Galapagos Art Space, Pauline Oliveros Foundation, Roulette, Saratoga County Arts Council, Saratoga Film Forum, Saratoga Springs Public Library, Sephardic House, Smack Mellon Studios, Squeaky Wheel, Temenos, The Arts Center of the Capital Region, The Kitchen, Lower East Side Festival of the Arts Theater for the New City, Third World Newsreel, Unique Projects Inc., Upper Catskill Community Council of the Arts, and the Media Center at Visual Studies Workshop. Founded in 1999 The Media Arts Technical Assistance Fund is designed to help non-profit media arts programs in New York State stabilize, strengthen or restructure their media arts organizational capacity, services and activities. The mission is to help organizations to address systemic issues within institutions and within the field. Through direct assistance the program supports organizational development, and the building of critical skills within the organization which will assure its vitality and longevity. An important component of the Media Arts Technical Assistance Program encourages the media arts community to meet and discuss issues which have bearing on the field's vitality and longevity. Media Arts Breakfast Meetings and other gatherings Upstate are held on a regular basis to meet and share visions and concerns. In addition to direct support, Technical Assistance helps organizations to attend professional conferences, seminars and festivals including the Lake Placid Film Forum, NAMAC's Media Arts Leadership Institute, Looking Back/Looking Forward a symposium on moving image preservation, Info Fair sponsored by Media Alliance, NAMAC's Pull Focus 2002 conference, the National Arts Marketing Conference, (2003), the Alliance for Community Media's NE Region Connecting Media Democracy and an Open Civil Society, 2002 Association of Moving Image Archivists Annual Conference, The Taos Talking Pictures Film Festival, the International Film Seminar's 49th Flaherty Film Seminar 2003 and the 2003 Alliance for Community Media National Conference. This year's total request to Technical Assistance was over $ 95,000. The program provided about $45,000 in support of 33 organizations which included Association of Independent Video and Filmmakers, ARK, Artists Space, Asian Cinevision, Children's Media Project, Crandall Public Library, Donnell Library Media Center, Downtown Community Television Center, Educational Video Center, Experimental TV Center, Electronic Arts Intermix, Eyebeam Atelier, Fales Library at New York University, Film Society of Lincoln Center, Film/Video Arts, free103point9, Global Action Project, Guggenheim Museum, George Eastman House, Hallwalls, Imagenation Film Festival, IMAP, Japan Society, Konscious Media Inc., Lower Manhattan Cultural Council, Manhattan Neighborhood Network, Media Alliance, Museum of Modern Art, Milestone Films, National Black Programming Consortium, Smithsonian Film and Video Center National Museum of the American Indian, Squeaky Wheel, Standby Program, Third World Newsreel, and Women Make Movies. Begun in 1994, the Video History Project is an online research initiative which reflects the complex evolution of the media arts field, and encourages a collective voice in the crafting of our histories. The goals of the Video History Project are to provide a dynamic vehicle for the creation and dissemination of an inclusive media history; to help establish bridges for intellectual access to information regarding the history of the field; to position independent media arts activities within a broader cultural context by cultivating research and public programming of these materials by those in the arts, humanities and sciences; and to encourage alliances among collecting institutions and educational and curatorial programs for the preservation of critically endangered works, instruments and documents. Goals are realized in an interrelated set of activities combining research and scholarship, realized on the web and as collaborative projects supporting issues in electronic moving image preservation through the hosting of conferences and seminars. The first conference, Video History: Making Connections, (1998) brought together over 250 pioneering practitioners and contemporary artists working in new media and interactive technologies. In June 2002, the Center invited over 60 media arts professionals, conservators, technical experts, and artists to gather at the historic firehouse home of Downtown Community TV Center in New York for Looking Back/Looking Forward, a two-day working symposium on moving image preservation. The symposium was organized by the Experimental Television Center, in association with Independent Media Arts Preservation (IMAP) and Bay Area Video Coalition. Focused on the physical preservation of independent electronic media works and related issues concerning tools and ephemera, Looking Back/Looking Forward facilitated an honest and sometimes disturbing evaluation of our progress as a field and informed discussion about necessary and realistic initiatives and partnerships. Participants at the symposium included representatives of Art and Science Laboratory (Santa Fe), Artists Television Access (San Francisco), Bay Area Video Coalition (San Francisco), Electronic Music Foundation, Electronic Arts Intermix, Experimental Television Center, George Eastman House, Guggenheim Museum, IMAP, la foundation Daniel Langlois (Montreal), La Guardia Community College, MercerMedia, Museum of Modern Art, National Museum of the American Indian, New York University Preservation and Cinema Studies Departments, New York State Council on the Arts, Smithsonian Institution Archives (Washington), Standby Program, Tate Gallery (London), The Kitchen, V Tape (Toronto), Video Data Bank (Chicago) and WNET. We are now working on edited proceedings and reports to be posted on the Experimental Television Center's Video History site. Looking Back/Looking Forward was also documented on videotape by Bay Area Video Coalition. The Preservation area of the Video History website contains two commissioned texts. Video Preservation: The Basics by Sherry Miller Hocking and Mona Jimenez, was originally written in 200, with assistance from a Media Action Grant from Media Alliance. Sherry Miller Hocking engaged in a significant revision of the text in 2002. Reel to Real: A Case Study of BAVC's Remastering Facility (2002) was written by Luke Hones, and edited by Sherry Miller Hocking and Mona Jimenez. The Preservation resource area also contains a selection of historically important texts concerning early efforts at media preservation. In 2003 we produced a CD Early Media Instruments which features a database of significant imaging devices which played a critical role in the historical development of independent media art. The database contains photographs of the devices, examples of product literature, as well as texts and manuscripts describing the tools. The devices include video, audio and computer-based tools, both commercially available and designed by artists and engineers. The CD was featured in a three month long exhibition "Origins" at ArtsInteractive Gallery, curated by Mary Ann Kearns for the Cyberfest in Boston, along with representative tools from the era of the early 1970s. The focus since 2000 has been on the continued enrichment of content on the Video History Web and the development and implementation of collaborative strategies for advancement of electronic moving image preservation resources and tools. Formally launched in 2000, the Video History Web functions as a both a dynamic and interactive on-going research collection and dissemination vehicle for media professionals, educators, and media programmers as well as the general public. Resources include critical essays, manuscripts, interviews, biographies, an extensive bibliography with over 1000 entries and information on collections, distribution, tools, preservation, organizations, and individuals. In the Chronology area you can generate a timeline of events in media arts history, or view the events within a defined range. The fully searchable site structure serves information contained in 12 databases holding nearly 5000 records. Results are reported topically, organized by resource area. The search function allows visitors to search all of the records, encouraging the visitor to discover broad interconnections among people, places and events. Each resource area contains historically significant texts, descriptive information and extensive links. Visitors are encouraged to contributed information to the chronology and bibliography areas, and also to those areas which provide access to historically significant texts concerning the evolution of media art and community television. We also target resources, gaining permission before materials are electronically published. Information is uploaded to the site on a regular basis. The Center's programs are supported by the Electronic Media and Film Program at the New York State Council on the Arts, the Statewide Challenge Grant Program, the Media Arts Program of the National Endowment for the Arts, mediaThe foundation, The Andy Warhol Foundation for the Visual Arts, the New York Foundation for the Arts, the Media Action Grant Program of Media Alliance, by corporate support from Dave Jones Design and Black Hammer Productions and by the contributions of many individual artists.